The Ol Pejeta Conservancy manages Sweetwaters Chimpanzee Sanctuary that provides a safe and secure lifelong refuge to orphaned chimpanzees. 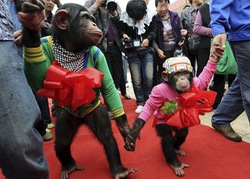 The sanctuary is also used as a platform to raise awareness on the plight of chimpanzees in the wild. While the sanctuary has played a key role in providing refuge to orphaned chimpanzees, it will now expand to take a leading role in advocating for the plight of chimpanzees and other great apes in the wild. Inadequate information on the illegal trafficking of great apes and knowledge of the illegal trade routes and persons involved has provided a reason for non-enforcement of international laws designed to curtail the trade in wild apes. This limitation coupled with the lack of space in many Pan African Sanctuary Alliance (PASA) approved sanctuaries in chimpanzee range states has limited their ability to offer refuge to numerous orphaned chimpanzees that are currently in need of homes. Inadequate information on illegal trade has also hindered sustained active campaigns and advocacy against the illegal trade in great apes and other threats facing the apes in the wild. PEGAS aims to understand and document the illegal trade in great apes, map trade routes and identify individuals involved as well as use information emanating from the project to create a platform to lobby for enhanced law enforcement. Where opportunities exist to repatriate illegally exported chimpanzees to Africa, PEGAS will work with Ol Pejeta Conservancy and PASA to achieve this. Undercover investigations over the past 10 years have unearthed an insidious great ape criminal trafficking network. Great apes are in Appendix I of the Convention on International Trade in Endangered Species (CITES), which means that their trade for commercial purposes is strictly prohibited. But the UN estimates almost 3,000 great apes – our closest living evolutionary relatives – are lost every year in trafficking occurrences, as several are killed for every infant captured. Chimpanzees, bonobos, gorillas and orangutans – the four types of great apes – are in great demand in Middle Eastern and East Asian safari parks, zoos and private menageries. They are money-makers for the owners as a fee-paying public flocks to watch them perform in demeaning skits, wearing colourful costumes while riding bicycles or playing drums. After the show they are locked up in dark, barren cages to await the next performance. Imagine your child or little brother or sister in such a situation. Great apes experience very similar emotions to humans, so they suffer greatly in this cruel slavery condition. Most shocking is the fact that corrupt national CITES officials in several countries are deeply involved in the trafficking. They doctor fraudulent CITES permits and sell them to traffickers, who use them over and over to export the apes, usually infant orphans whose mothers have been killed for bush meat. Hunters go into the forest with shotguns and ruthlessly blast the adult apes and capture the traumatized infants. This slave trade must stop. Let great apes live like great apes in their forest homes. The Arcus Foundation did not continue funding of PEGAS, so the project activities are winding down.